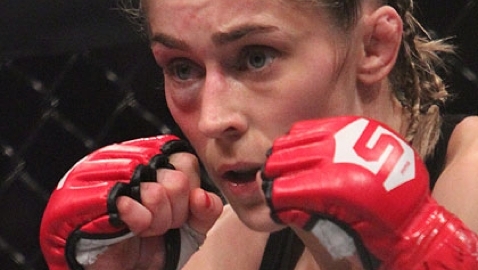 An injury has forced Julia Budd (8-2) to withdraw from her inaugural Bellator MMA women’s featherweight championship bout against Marloes Coenen at Bellator 155. Alexis Dufresne (5-2) will now face Coenen in the featured preliminary bout at the CenturyLink Arena in Boise, Idaho, on May 20 in a non-title bout. The event, Bellator 155: Carvalho vs. Manhoef, is headlined by a middleweight championship bout between champion Rafael Carvalho (12-1) and Melvin “No Mercy” Manhoef (30-12-1). In the fight card’s co-main event, former featherweight champ Pat Curran (21-7) returns to action for the first time since June 2015 to take on Georgi Karakhanyan (24-5-1). Former Strikeforce women’s bantamweight titleholder, Coenen, is riding a two-fight winning streak and is undefeated under the Bellator MMA banner. The 35-year-old Dutch submission specialist looks to spoil the Bellator MMA debut of Dufresne. The 25-year-old Dufresne began her career with a blazing start, earning victories in her first five scraps, all of which she ended in the first round. The “Sneaky Zebra” has put together an impressive resume, but is coming off two consecutive losses in the UFC. Dufresne will be making her Bellator MMA debut and hopes to get back to her winning ways when she fills in for the absent Budd on short notice.